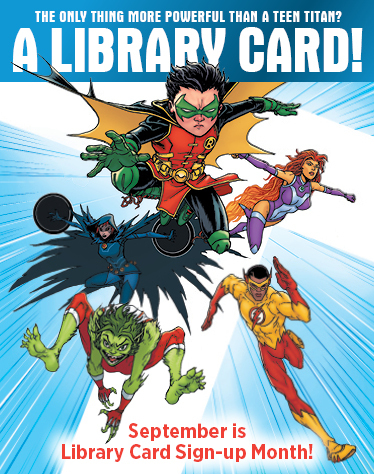 This year’s Library Card Sign-Up Month resources feature DC Super Heroes, the Teen Titans. Posters and bookmarks are available for purchase through ALA. There are also press releases and PSA scripts in both English and Spanish, sample Tweets, Twitter and Facebook sized images, and many other great resources available here. Check them out and use them to promote this month! Earlier this year, ALA updated their advocacy tool Quotable Facts about America’s Libraries with new information and research. For instance, you had probably heard before that there are more public libraries, including branches, than McDonald’s in the United States. But did you know that there are also more public libraries than Starbucks? Also, there were 96.5 million attendees at public library programs in 2013, which is more than all Major League Baseball and National Basketball Association games combined! Now those are some impressive facts! You can purchase the pocket-sized fold out cards by emailing advocacy@ala.org, or you can download them in English and Spanish here. There is also an annotated version here so we can cite our sources. Virtual Membership Meetings are an important way in which personal members may affect what ALA does. VMM is an annual online forum where ALA leaders present information about topics of interest to the general membership. All ALA personal members may register for and participate in the VMM. Virtual Membership Meetings are part of ALA’s ongoing efforts to reach out interactively to members about its strategic direction, budget priorities and topics of interest. Live captioning is provided for all participants. * provide participants the opportunity to submit and to vote on resolutions or testimonials. You can learn more about the meeting and register here. The LITA Forum is looking for proposals from public and school librarians to provide conference sessions for those that work in these libraries. One of the three keynote speakers is Cecily Walker of the Vancouver Public Library, Librarian with Attitude. Help us round out the program with a session from you. The deadline is May 13th. The Forum is a highly regarded annual event for those involved in new and leading edge technologies in the library and information technology field. Please send your proposal submissions here by May 13, 2016, and join your colleagues in Fort Worth, Texas. The 2016 LITA Forum Committee seeks proposals for the 19th Annual Forum of the Library Information and Technology Association in Fort Worth Texas, November 17-20, 2016 at the Omni Fort Worth Hotel. The Forum Committee welcomes proposals for full-day pre-conferences, concurrent sessions, or poster sessions related to all types of libraries: public, school, academic, government, special, and corporate. Collaborative and interactive concurrent sessions, such as panel discussions or short talks followed by open moderated discussions, are especially welcomed. We deliberately seek and strongly encourage submissions from underrepresented groups, such as women, people of color, the LGBT community and people with disabilities. The New Submission deadline is Friday May 13, 2016. Presenters will submit final presentation slides and/or electronic content (video, audio, etc.) to be made available on the web site following the event. Presenters are expected to register and participate in the Forum as attendees; a discounted registration rate will be offered. If you have any questions, contact Tammy Allgood Wolf, Forum Planning Committee Chair, at tammy.wolf@asu.edu. Slides from The Association for Rural and Small Libraries 2015 Conference that took place in Little Rock, Arkansas have been made available on the ARSL website. Hutto Public Library Celebrates Banned Books Week! Library Director Paula Waak and her staff made an eye-catching display illustrating Banned Books Week. This certainly gets the message across! Good work, Paula! Just a reminder that September is Library Card Sign-Up Month! ALA has a wealth of resources available to use in your outreach such as a proclamation, a press release, scripts or audio for public service announcements, printable posters, website banner images, Facebook cover images, and more! Snoopy is the Honorary Chair for this year’s celebrations! Are you doing anything to celebrate Library Card Sign-Up Month at your library? Let us know and send pictures! Join SLJ on August 13th at 11am ET for a full day of free online programming tackling important issues impacting your teen collection and programming. You’ll hear directly from authors about their current and forthcoming titles in an engaging conversational format, including live Q&A with the audience. Panels will focus on important teen issues and trends, including the transgendered experience, selecting quality nonfiction, and navigating romance genre mashups. New this year are sessions dedicated entirely to teen services and programming! Learn from innovative librarians about gaming in the library, setting up teen volunteer groups, and launching a “Con” in your library. Plus, explore our virtual exhibit hall and hear directly from publishers about their newest books you’ll want for your collection this year, and enjoy live chats with featured authors. SummerTeen is a free, completely virtual conference—no traveling and no cost! It’s a must for teen and young adult services librarians, and educators from public and school library settings, as well as teen advisory groups, book clubs, and anyone who loves YA/teen literature. Go here for more information and to register for this event! Library Journal just released their top rated libraries for 2013. Check out all of the Texas library shining stars! Congratulations! Didn’t make the rankings this year? Library Journal provides the data used to assign the rankings which could prove to be useful information! Check it out and learn how to improve your standing and, most importantly, service to your patrons!